Some months ago, I raised the subject of the use of low-grade aerial and satellite downlead cables, and gave some examples of the sort of reception problems they can cause. Awareness of these problems made me wish that I had a valid way of comparing the various types of cable in common use. 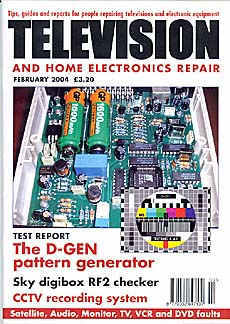 Article reprinted by kind permission of 'TELEVISION and Home Electronics Repair' magazine. See Bill Wright's web site click HERE. The effects of the use of inferior cable can be bad enough with a small domestic installation but are much worse, and more expensive to correct, with a distribution system that serves say a dozen flats. Quite often the TV system will, with a building contract such as a block of flats, be part of the electrical contractor's work. He in turn will pass on the specialist part of the work to a local TV shop or aerial installer. The electrician will supply and install the TV cables from the head-end or repeater positions down to the outlets. The aerial contractor's job is to come in near the end and install the aerial, dish, amplifiers, trunk cables and everything else that's necessary to make the system work. I always specify the type of cable needed, and make it plain that, if the electricians use poor-quality stuff, I can't be held responsible for any problems that might arise. In the world of competitive tendering however the temptation to cut corners is strong, and quite often my insistence on the use of good-quality coaxial cable is ignored. On many occasions I'm not even asked of course, because I'm not invited on to the job until it's too late - after the walls have been plastered and decorated. Now I'm never in any doubt about making a fuss over this, the only question being how much fuss? One might have a vague feeling that the signal levels at the outlets farthest from the head end are likely to be a 'bit low', but this sort of vagueness isn't enough when you are threatening to withdraw all relevant warranties. Some time ago I realised that I needed a quantitative measure of the performance of different types of cable. Since the manufacturers of 'budget' cables don't publish figures, I decided to carry out a few simple tests to find out the extent to which the performance of various types of cables differs. Even if you never install anything more complicated than an aerial feeding one set, I think the results will be of interest to you. Type A, with semi-airspaced dielectric, copper tape and copper braid. Type B, with foam dielectric, copper tape and copper braid. Type C, with semi-airspaced dielectric that has 'silver-paper' wrap and copper braid. Type D, with semi-airspaced dielectric and copper braid. Type A, semi-airspaced dielectric with copper tape and copper braid: Commonly known as 'copper-on-copper', the best-known example of this type is Raydex CT100 [Ed: obsolete]. Other makes are Pope H109 [Ed: obsolete], Webro WC100, [Ed: obsolete] Cavel QC100 and Hycomm HYC100. The designation CT100 is often used in a general sense, no doubt to the great annoyance of Raydex. Be aware that some cables sold as 'CT100-type' are nothing like the genuine thing. The expression semi-airspaced refers to the construction of the white dielectric, and means that it has 'cells' (holes) that run through it longitudinally. All semi-airspaced cables seem to have five 'cells', see Fig. 2. Copper prices rise and fall but, at the time of writing (2004), this type of cable should cost no more than £18 + VAT per 100m. Confusingly, this type of cable is sometimes incorrectly called "double screened". Fig. 2: Different types of dielectric. Top left, foam dielectric used in type B cable. Top right, semi-airspaced used in type D cable. Bottom left semi-airspaced used in type C cable. Bottom right semi-airspaced used in type A cable. Type B, foam dielectric with copper tape and copper braid: These cables are identical to type A products except that they have a foam instead of a semi-airspaced dielectric. Semi-airspaced cables can deform quite easily when mishandled and for this reason foam cables, which are more robust when bent or crushed, are making a comeback. It's very difficult to fit semi-airspaced cable into a backbox without it kinking, so the reintroduction of foam cables seems to be a good idea. The foam cables of yesteryear absorbed atmospheric and other moisture rather readily, resulting in severe performance degradation, but the manufacturers assure us that the modern products are free from this defect. This type of cable is similar in price to type A, or perhaps slightly cheaper. The many different products available include Webro WF100, Triax TX100 and Cavel QF100. 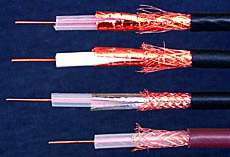 Type C, semi-airspaced dielectric with 'silver-paper' wrap and copper braid: This cable is sold as 'satellite downlead' but Sky forbids its use. The screen consists of a transparent plastic mylar film wrap with a microscopically thin layer of silver-coloured material (aluminium) bonded to it and very low-density copper braid. One peculiarity of this type of cable is that the dielectric will slide along very easily inside the screen. If the cable has been stretched slightly during installation, the inner core and dielectric can retract out of the F plug shortly afterwards, causing severe installer confusion! These cables sell for about £8.50 + VAT per 100m. The price says it all. Type D, semi-airspaced dielectric with copper braid: This cable has no foil wrap. It's commonly called 'low-loss', a designation that originated in the early days of UHF transmission to distinguish it from the smaller-diameter, solid-dielectric cables used for VHF. In fact it is "high loss" compared with types A, B & C. It usually has a brown outer sheath, though the DIY sheds stock it in white. Over the years the braid density of 'low-loss' has mysteriously decreased. In 1969 it was quite a job to unravel the braid when fitting a coaxial plug: now there's hardly anything to unravel! 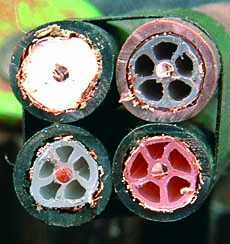 Some manufacturers still produce this type of cable, with braid coverage as high as 60 per cent, but these products are rarely used. Much more common are the cheap versions with braid coverage as little as 20 per cent. 32-CV cable is a good example of this type. No manufacturer has ever pretended that this type of cable is suitable for satellite use, but this fact is persistently ignored by builders, and by Bodgitt & Scarper Aerials and others of that ilk. What the motive is I don't know, because these cables are generally no cheaper than the C type ones. This cable is the site electrician's favourite. Left to their own devices, this is what some of them will use for everything - UHF, satellite, surveillance cameras, dog leads, the lot. It's almost universally used for built-in downleads in new housing, where individual aerials will be fitted. I tested types A and B first, and was relieved to find that my results corresponded pretty closely with the various manufacturers' figures. This suggested that my experimental method is valid. It is, in fact, very simple. I laid out exactly 50m of each cable, making sure that there were no kinks or sharp bends. As a UHF signal source I used a vision modulator from Satellite Solutions: Sky digital transponders were used as the satellite IF source. I checked both these sources at regular intervals during the tests, to make sure that there was no variation. The measuring instruments at the other end of the cables were recently-calibrated spectrum analysers. Fig. 3 shows the results. Cable types A and B performed almost identically, so the results are shown as a single line. Losses climb to 18dB per 100m at the top of the UHF band, and 33dB at the top of the satellite IF band. Cable type C is significantly more lossy at 24·5dB and 44·5dB respectively. There are many different D-type cables and, frankly, you only have to look at some of them to see that they are about as much use as wet string. For the tests I used one of the better products. Even so type D contributes a loss of 32·5dB at the top of the UHF band and a massive 66dB, double the figure for types A and B, at the top of the satellite IF band. Bear in mind that dB is a logarithmic ratio so 3dB represents a doubling of signal level. A loss of 66dB means that there's almost no measurable signal left! What do these figures mean in practice? If we leave aside cable deterioration with age (of which more later), probably not all that much where cable runs are short. The problems arise where cable runs are longer than average, and where signal levels or carrier-to-noise ratios are marginal to start with. Take the following situation for example. A wideband UHF aerial feeds a simple domestic distribution amplifier via 10m of cable, and one or more of the downleads from the amplifier to the outlets is 25m long. The signals carried include analogue ch. 21, transmitted at 500kW, and a 'must-have' digital multiplex on ch. 67, transmitted at 10kW. Sounds familiar? If type A or B cable is used the overall loss on ch. 67 will be 6·3dB. If type D cable is used, the overall loss increases to 11·4dB, and the ch. 67 signals will be attenuated 2·5dB (about 40%) more than the ch. 21 signal. This will add to an already very unsatisfactory signal-level imbalance and could increase the chances of digital signal dropout. Where cable runs are 30m or longer, type D cables are quite inadequate for UHF and of course absolutely hopeless for satellite IF. Although type C cable performs significantly better than type D, in my opinion it is so far behind types A and B that it should not be used for good-quality UHF or satellite installations. For budget domestic installations, maybe. Cables of this type are sold as 'satellite' cable, and the unwary could quite reasonably suppose from this that their performance is good enough for even the more demanding installations. Incidentally, distribution systems that carry satellite IF signals have each downlead going back to a polarisation switch and, since the switches are normally located together in large groups (see Fig. 4), the downleads are likely to be long. In the case of the block of twelve flats mentioned earlier, all the downleads will lead to one amplifier and switch unit, so some of the cables might easily be 40m in length. Where satellite cable runs exceed 30m I prefer to use CT125 cable. This is a larger-diameter version of CT100 but note that twist-on "F" connectors are not available for CT125* cable. *(CT125 is no longer available. The modern equivalent is WF125 for which twist-on F plugs are available). Fig. 4: A distribution system head-end, ready for installation. The earth rails at the bottom are the connections for twenty downleads, some of which will be 30m long. 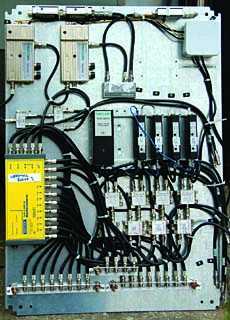 The connections on the right are the feeds to the repeaters. Inadequately-screened cables will both radiate and receive signals. This is a difficult thing to measure properly unless you have an electronics laboratory, but I was able to carry out a simple experiment that gave comparative, though not absolute, figures. I laid out 50m of each of the cables under test, along with an additional length of type D cable. The latter, used as a 'transmit' cable, was connected to a high-level signal source. The other cables were tested for their ability to receive from it - or, perhaps I should say, their inability not to receive from it! All five cables were bundled together very loosely, with cable ties at 1m intervals, to simulate the sort of proximity that would be present if the cables had been installed in a wall cavity, across a loft, or whatever. The far ends of the cables were all terminated at 75 Ohm. The test was done at one frequency only, 727MHz. Table 1 shows the crosstalk figures, which are simply the differences between the signal fed to the transmit cable and those obtained from the receive cables. These are negative logarithmic ratios and -80 represents a miniscule amount of signal leakage compared with -29. Although the signal source and the measuring instruments were 5m apart, I think that the results for cable types A and B were compromised slightly by direct transmission from source to instrument. This is likely to happen with a ratio of 80dB. Slight movement of the connectors caused a fluctuation of a few dB. So, for this reason, the figures for cable types A and B are probably slightly worse than they would be in practice. The crosstalk with cable types C and D was much more 'solid'. I repeated the experiment, this time with all the cables reduced to 20m. The results were virtually unaltered. I also attempted an experiment using type A cable for transmission, but could get no meaningful results from cable types A, B or C.
This strongly suggests that if the cables in an installation are all of type A or B, crosstalk will be unmeasurably small. Cable type C's performance is perfectly adequate. But look at type D, returning -29dB! Remember that analogue video needs a signal-to-noise ratio of at least 46dB. This simple test confirmed what a lot of installers have always suspected. Many and varied are the interference problems that can be cured by replacing cheap coax or flyleads with CT100 (Ed: WF100) cable. Satellite IF leaking into a UHF feeder, computer noise entering the flylead of an adjacent TV set, maintained lighting chargers putting white lines across all the TV screens in the building - the list is endless. Downleads inevitably pass alongside or at least near mains cables so, given digital terrestrial TV's susceptibility to impulse interference, type D cable is simply not suitable. Coaxial cables deteriorate with age, mainly because of the gradual ingress of moisture. Visible evidence is presented by a yellowing of the dielectric and dark discoloration of the copper. Even when these signs are not present, the performance of a cable may fall off severely over a period of years. Type D cables seem to suffer most, probably because the outer sheath is more permeable and there's no foil screen to act as a moisture barrier. TV distribution systems often share ducts and voids with district heating schemes and other plumbing: in such a humid, damp environment type D cables will become astronomically lossy after a few years. The signal losses are much worse at higher frequencies so, if you are quoting for the conversion of a system from Group A analogue to wideband digital, beware! In my opinion type D cable should not be installed behind the plaster in a new building. I suspect that it picks up moisture as the building dries out, because deterioration seems to set in very quickly. This can become a serious problem early in the life of a building. The way technology changes nowadays, it seems very short-sighted to use anything less than CT100 cable [Ed: now obsolete - use WF100]. The cost difference is, after all, at most only a few pounds, and who knows what signals and frequencies these cables will be expected to carry during their lifetime? For example, the Johanssen Stacker/Destacker system uses frequencies up to 3.4 GHz ! The characteristic impedance of coaxial cable depends partly on the ratio between the diameter of the inner conductor and that of the screen. When a cable is forced into a tight bend this ratio changes and an impedance 'bump' is created. This isn't the place to go into cable impedance, standing waves and what have you but, take my word for it, impedance bumps are a Bad Thing! The minimum acceptable bend radius is usually regarded as being about ten times the cable diameter, whatever the cable type. What happens if a cable is bent repeatedly? This can occur during a difficult installation, or during normal use over a long period. Type C cable, with its transparent plastic wrap and thin layer of conductive material, suffers badly. Tiny radial cracks appear in the conductive coating and, since the braid is very skimpy, impedance 'bumps' are likely. But I must stress that repeated flexing of any coaxial cable will cause damage. The copper foil in type A and B cable can crack and, of course, the inner core of all cables will eventually snap. Special flexible coaxial cables are available, with seven-strand inners, solid dielectric and a dense braid of fine wire. But they are expensive and 'lossy', and are thus only really suitable for short interconnecting leads. Cable clips should be of the correct size, and cable ties should not be over-tightened. Cables can be trapped and squashed accidentally, especially on a building site. When planning cable routes, try to anticipate the actions of 'other trades'. Cables in lofts should not run where, for example, they may fall victim to plumbers' size-twelve boots. Clip them to the side of timber that will be walked on, not the top. If it seems likely that a cable run will be mistreated in this way, use type B: foam-dielectric cables are physically tougher than any of the semi-airspaced ones. The list is many and varied. One such cable has no braid, just a few strands of wire that run longitudinally, and some sort of shiny (and allegedly conductive) coating that's attached to the inside of the outer sheath. 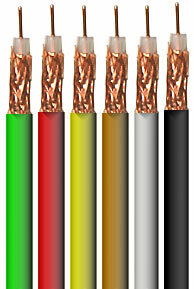 Apart from the obvious screening deficiency, it's difficult to make a convincing connection to this type cable, which is very susceptible to kinking and crushing. Sometimes electricians will use oddments of coaxial cable left over from previous jobs. This is where you are likely to encounter cable that's intended for baseband video use. Such cable is easy to spot, because it has a solid dielectric. It's very lossy at UHF, and utterly hopeless for satellite use. Remember that to the average electrician coax is coax, and if he has half a reel left over from a surveillance-camera installation he will use it for TV downleads. Similarly you may encounter 50W and 93W coaxial cable, which is useless for TV purposes. Any cable with an overall diameter of less than 6·5mm is highly suspect. Some cables have a type number printed at intervals along their length. Amongst the hundreds of different types of unsuitable coaxial cable that are available the following, in my experience, are commonly found on building sites masquerading as TV downleads: URM43, URM70, URM76, RG58, RG59 and RG62. If you come across an unfamiliar cable, I suggest that you take a sample away and test it. Even a short length, say 10m, of unsuitable cable will show excessive signal loss if compared directly with the same length of CT100 cable. Carry out the test with high UHF channels or satellite IF. Thin braid cover is a sure sign of inadequate screening. For distribution systems and good-quality domestic work use copper-on-copper cable with either semi-airspaced or foam dielectric. If the cable will, unavoidably, have to be forced into tight bends, or might be crushed, use a foam type. For long runs, especially with satellite signals, consider the use of a larger-diameter cable such as Raydex CT125 [Ed: obsolete - use WF125] or Cavel QC125. These cables need special connectors which are normally crimped on. Ordinary "twist-on 'F' connectors" will not fit. [Ed: However, SatCure supplies twist-on 'F' connectors for its WF125, WF65, WF100, and SATDS cable]. For budget domestic work, type C cable is probably the best choice. Since this type of cable costs about the same as the 'low-loss' type D, there seems to be no point in using the latter. But bear this in mind: the cost difference between the best cable and the worst is only about £1.50 for a standard domestic aerial job. I have to say that the only cables you will find in the back of my van are types A and B. Most installers know that good cable is essential for satellite use [Ed: and Freeview digital terrestrial], but I hope that this article has clarified the differences between 'good', 'not so good' and 'bad' cable. The message hasn't quite got through to many, however, that UHF also requires good cable. I think our trade should recognise that cable quality is an important issue, particularly for digital reception. This file may be downloaded for private and personal use but NO part of it may be published in any form without the prior permission of TELEVISION magazine. WF100 cable - 6 colours available from SatCure.